Big data, customer-driven buying cycles, and new demands on marketers. These business trends are enough to cause perpetual stress and paralysis. If you are like some of my clients, you may think these forces require you to DO more. What if, INSTEAD, you tried to just BE more? This approach may feel counter-intuitive to many of you. My parents taught me that hard work was the key to success. Now, thirty years and several gray hairs later, I realized that belief accelerates career burnout. In today’s crazy-busy world, we need a little extra help to stay balanced. We need to find our Inner Marketing Guru (IMG). Mindfulness is the art of paying attention to several elements, such as our body, emotions, and our state of mind. An absence of mindfulness severely restricts our ability to learn from our surroundings and from others. Investigation is the ability to understand and accept the dharma, or the true nature of all things. Think of this as your reality check. It helps you see things as they really are. When you assume you already know what customers want, or truly believe you can change another person’s behavior, you are probably grappling with accepting the nature of things and inflicting unnecessary suffering on yourself. Tranquility occurs when you can calm the body and mind. Google and Huffington Post offer employees technology free meditation rooms to unplug from the hectic work pace. 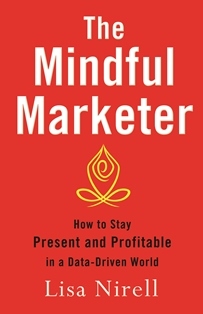 Your Inner Marketing Guru can help you be more mindful and wise. Are you listening?